I find it humbling to think that for most of our collective human history, our ancestors lived lives that have left the feeblest of traces. Most of human existence has been lived using 'Stone Age' technology. That's shorthand for saying that people hadn't yet developed metallurgy, and they hadn't affected the animal and plant species around them enough to 'domesticate' them. Fascinatingly even at this distant time and even with the evidence being so small in quantity and fragmentary, it's clear that people had intangible beliefs. For example, they way they buried their dead shows they believed in some kind of afterlife. This ancient way of life lasted from the earliest times recorded by archaeology until the ice sheets began to melt around 12,000 BCE. 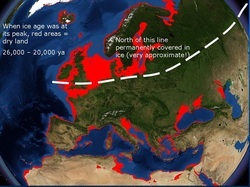 A lot of Palaeolithic evidence will lie under the waves of the Mediterranean, as melting ice made sea levels gradually rise around the world.